Map maker : MEISNER, D.. Size : 3.7 x 5.9 inches. / 9.5 x 15.0 cm. Description :Wonderful, miniature copper engraving of Troye. There is a Latin title at top and the text below the print is in Latin and German. The city of Troye is shown in the background, with truly exceptional detail of the buildings. These engravings are based on Braun & Hogenberg's engravings of 1572. 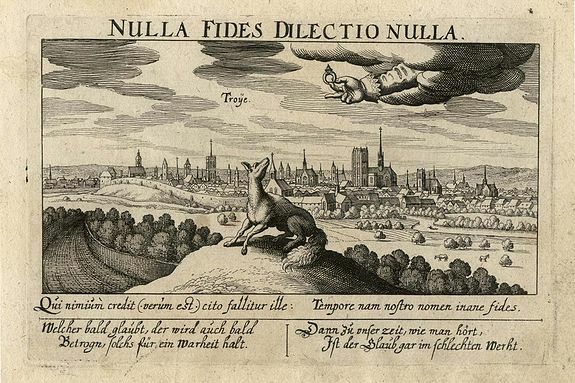 Meisner's book of city plans was originally issued in 1623 with only 52 plates. In 1624-6, it was re-issued with 416, and again in 1642 with 800 plates. This is from the 1642 edition. Condition : In good condition.